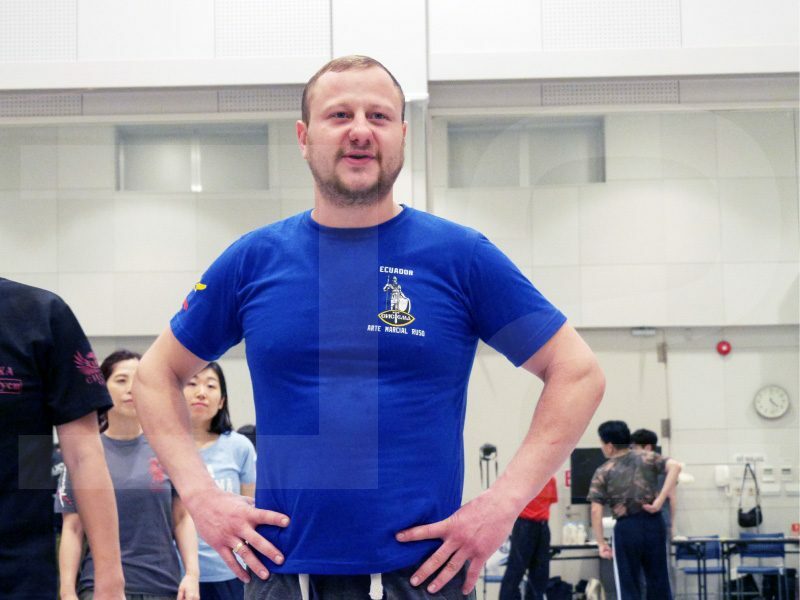 Daniil Ryabko, the first son of Systema founder Mikhail Ryabko, is a Systema instructor whose genuine capability as an instructor is already well known. In contrast, his personal facts are rarely revealed despite of his frequent travel to Japan. This time Kotsu editorial staff met with Daniil for a special interview to bring out his personal history, focusing on how he was taught Systema from his father Mikhail, his career so far, and what Systema means to him. K: Congratulations on your child’s birth (Daniil had his first child in autumn 2016). K: What is his name? D: Vasily. We took it from my grandfather. My name was taken from my father’s grandfather. So we are repeating the same names – Daniil, Mikhail, Vasily, Daniil and so on. K: Through this interview we want to focus on your personal history. More specifically, how you learned Systema, and your career so far. D: Well first, take a look at this video. It’s too private I can’t open it to public, but you can see Mikhail pushing Vasily back and forth who is lying down on the bed. Vasily is rolling across the bed and sometimes holding up his body. This, indeed, is already Systema training. I assume this is exactly the same as how I started my training, so I myself am not aware of when and how it started. K: How old are you now? D: 32. I was born on December 28th, 1984. D: Tver, the same city where Vladimir Vasiliev was born. It’s a city 150km away from Moscow. D: I have a younger sister, Anna. She’s already married and has a 6 years old daughter. K: So you were already practicing Systema ever since you could remember? K: Do you remember any of the trainings as a little boy? D: I was always taken to training. You can see me running around (during training) in the videos back then (haha). K: Were you already doing push-ups as a little boy? D: Yes. Basically we went to gyms for training, but when gyms weren’t available we held trainings at home. I remember being two or two and a half years old, showing off doing push-ups to Mikhail’s students who came to our place for training. Mikhail also encouraged me to do so, so I did it many times. I also remember climbing up and down Mikhail like a monkey (haha). K: When did you first realize that the Systema trainings that you’ve been familiar with, was not simply a game? D: Well, it was always a game for me. I was never aware that it was Systema, or even any kind of martial arts. I was quite an active kid, so I was always running around, and whenever I see Mikhail, a “fight” starts in an instant. We were playing, for example Mikhail will push me or put me between him and the walls. Even when we were in the car and I was asleep in the back seat throwing my body towards the drivers seat, he will push me back with his elbow. And if my body goes forward again, he’ll push me back again. I think Mikhail’s strikes were more powerful back then than now. K: Mikhail was busy with his works he wasn’t at home that much? D: Not really. He had breakfast with us, drove me (and my sister) to school, and then went off to work so I actually feel we were always together. His shift at the Interior Ministry was 24 hours on duty followed by a whole three days off, so I think he was able to keep his balance. He also had a side business. He wouldn’t come back for one or two months in emergency situations, but it was rare. We travelled a lot. He would take a break almost every month to take us to ski. We also went to Cyprus several times. D: I went to various schools. I was hopping around various private and public schools. For example I was once at a private school where you go to school two weeks and have a week off. But a single day was intense and had 9 classes where usually you will have only four. This was rather a unique school, but I have been to ordinary public schools and ones where you stay at dormitories throughout the weekdays. At age 12 or 13, I planned to study abroad at UK, but we cancelled it because of bad political situation, even though we had already paid the tuition for the first year. At this point, Mikhail told me to go to the army instead of financial industry. So, training started the very next day to build my stamina. Ran ran ran everyday… (haha). I wanted to go to a national special military school, which wasn’t very easy to enter. I needed to mark high on both paper and physical examination, so I needed to workout. K: Were yourself willing to pursue that career? D: Well yes. It seemed interesting, and moreover I didn’t like studying that much. Indeed, military school was so fun I used to stay at school very late that my parents would come to pick me up, scolding, “What time do you think it is!” We did many sorts of training there, such as running across forests and mountains, wall climbing, target seizing, improving our driving skills, and shooting. Of course we did parachute trainings too. We had to jump off from an airplane and when I did it for my first time I had no idea what was going on, but I pretty much enjoyed it the second time. K: Do these kinds of training take place at military schools in common? D: No, where I attended was a special military school. We were separated into two groups, the basic course and the special force course. Everybody wanted to take the special force course, but those only chosen could be enrolled. The course was formed to educate military leader candidates, but not all graduates pursued their career to the army. K: How long did you study there? K: So did you join the army after graduation? D: No I went on to a national police university for 5 years, and then went to another university for a couple of years to study Law. I was able to finish the second university in two years because I had already spent 5 years at my previous university. Then I worked as a detective for two or three years. It was after that I joined the army, I mean the special force, and stayed there for about 5 years. K: What were you responsible for there? D: Looking after prisoners in prison and repression against riots. I was appointed to the unit that went to Chechnya. K: Which unit was this? D: SOBR (Special Rapid Response Team) of the Interior Ministry. Mikhail used to work there too. I was in a team called Fakel. Mikhail was in a team called Rus. SOBR is divided into many of these teams, and they let these teams compete with each other in various ways, such as track and fields, fistfights, martial arts matches and more. I was only appointed to a single team, but Mikhail seems to have been appointed to two or three teams. K: In such circumstance, did you ever come to realize that your Systema was something special? D: I have never felt that way even up to now. K: Did you often have fights in your childhood? D: My classmates never wanted to fight with me. I don’t know why. I had fights with seniors, though seldom (haha). Once at military school, one of my teammates kicked my crotch when we were forming a line. So I beat two or three mates around me, but then others came in and tried to hold me down so I ended up fighting against more than 10 people. Of course, in that situation I was totally knocked down at the end, but since this incident nobody came up to me for a fight. Even when somebody will try to sell a fight to me, seniors came to protect me. I assume there was somewhat a “good rumor” going around about me (haha). Maybe it was because I fought no matter how I was on the back foot, where some people will just freak out with a few punches. I continued my Systema training as a university student and detective. At P.E. class we had to practice martial arts. Our class had a new graduate teacher and taught us　martial arts like Judo and Sambo. But I knocked the teacher down so the teacher told me “I’ll give you the credits, you don’t have to class anymore”. I was also asked to join the university’s martial arts team. I refused to join because I couldn’t understand the point of fighting in competitions, but I once went to kill my time, and I won. After that I was often asked to join the selected team and participated in many competitions. When I became a high officer at the university, there was a riot and we needed certain documents in order to enter the campus. At that time as a member of the vigilante team, I was on duty 24 hours with a gun with me. They paid you for it, so I was being paid while still being a student. I did something similar at the Interior Ministry, too. There my duty was “surveillance” and “body guard”. K: You were involved in international matters as well? D: Yes in times but I’ll have to wait for more than 10 years to speak out about it. Born in Tver, 1984, as the first son of Systema founder Mikhail Ryabko. After completing military school and police university, proceeded his career as a detective. After working as a detective for two years, he then moved on to the Special Rapid Response Team (SOBR), a special force under the Russian Interior Ministry. There, along with various military missions, taught Systema to the special force troops. He now concentrates on his career as a Systema instructor and holds seminars worldwide.